Home What is an Oil Filter and Why Does My Ford Have One? 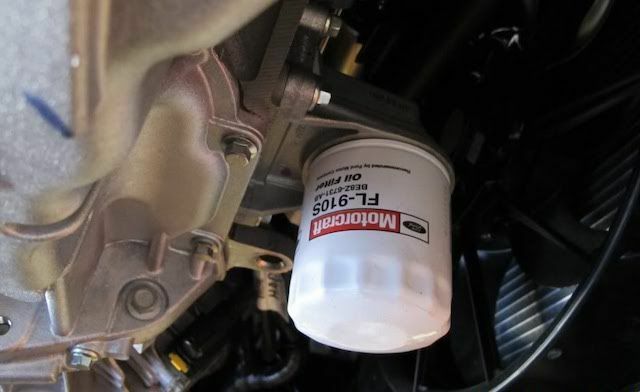 What is an Oil Filter and Why Does My Ford Have One? An oil filter is typically a paper filter enclosed in a metal canister slightly larger than your fist. They are attached to the engine in a location that allows for easy access. 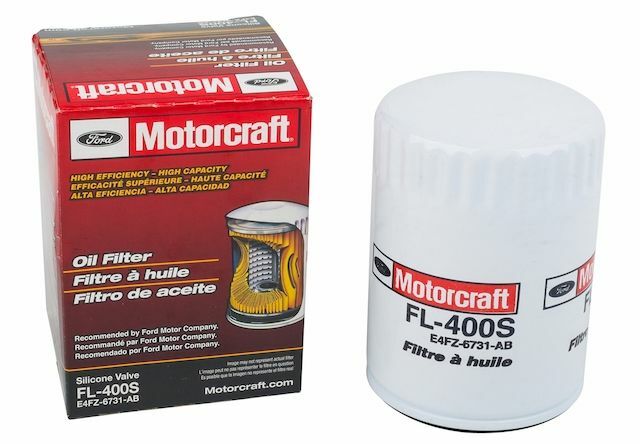 In this guide, you’ll learn all about oil filters and how they work. As the engine runs, tiny bits of metal are worn off of surfaces that rub on each other. Combustion byproducts leak by the piston rings and enter the oil. The oil itself degrades due to exposure to high heat. Small leaks let coolant enter the oil. The engine is designed to continuously cycle oil through the oil filter. The oil filter’s sole purpose is to trap as much dirt and foreign particles as possible before the oil returns to the engine. Without an oil filter, the oil is only going to get muckier and muckier every time it runs through the engine. The muckier the oil, the more friction happens between engine components. Which leads to more particles breaking off and contaminating the oil. It’s a never-ending cycle, and the best way to keep the amount of particles minimal is to constantly keep the oil as clean as possible. That involves changing the oil and the oil filter on a regular basis. For most people, when the word “filter” comes to mind, they visualize a flat, simple filter like a furnace filter. If you’re visualizing the same thing, then you might be surprised to find out that an oil filter doesn’t look like that at all. It’s more sophisticated, and for a good reason. The most common type of oil filter found in gasoline-powered cars is the full-flow oil filter. It’s basically a metal can with a pleated filter inside. The oil pump pulls oil from the oil pan, and pushes it through the filter. The clean oil is then passed through oil passageways to lubricate the engine. The full-flow oil filter comes with a fail-safe bypass valve that allows dirty oil to pass through if the filter becomes clogged. It’s so the engine can still get oil because dirty oil is better than no oil at all. As we’ve established, dirty oil is bad for the engine. That’s why the oil filter is designed to be a disposable part that should be replaced in regular intervals. To keep your oil as clean as possible, it’s recommended to replace the filter with every oil change. Years ago, oil change intervals were more frequent. A 3000 mile change interval was typical. The oil filter could be replaced with every other oil change. Modern engines have longer oil change intervals, up to 7,500 or even 10,000 miles. Virtually all OEMs recommend that you change the filter with every oil change. You’re welcome to contact us if you have any questions about Ford oil filters or if you need help finding the right part number for your model.